I was in Seattle last week. I took a week off from knitting for Cast On. I had finished up the poncho and sent it along with the man's sweater and the asymmetry sweater to the office for styling. The photo shoot is next week. I just have to finish up the boot toppers and hat for the confident beginner article. Only one lesson arrived while I was gone but three arrived yesterday. I feel awful when students have to wait for their reviews. While I was gone several new students signed up. It must be getting close to fall. This entry will discuss how to put stitches back on the needle and proper stitch orientation. If you have been knitting for awhile this seems obvious, but as I learned when I taught Binka's class, it isn't. I think every knitter has experienced reaching into a knitting bag and pulling out just the needles. How easy it is to put the stitches back on the needle depends on many factors including the fiber content of the yarn and the stitch pattern. I accidentally pulled out the needles from some lace I was knitting with linen and I was surprised to find that I could just slide the needles back on the needle. If you are not careful, you might not get the stitches properly oriented which can result in twisted stitches or you can drop a stitch that results in a hole or slipped stitch. The photo below shows stitches properly oriented on the needle. Notice that the right side of the loop on the needle is coming out of the right side of the stitch below. Here is how it looks on the WS. Notice that loop is on the right side of the stitch. Compare this photo of wrong orientation. 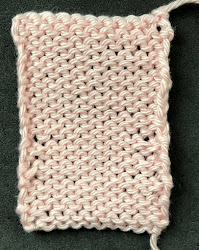 Notice that the loops are coming out of the left side of the stitch. Here it is on the WS. If you work the stitch through the front as you normally would, a twisted stitch results. The video shows two ways to fix this. You can slip the stitch to the right needle and change the orientation. The problem is that slipped stitches tend to stretch out which makes it larger than the surrounding stitches. The best way to deal with an improperly oriented stitch is to work it through the back. Salon will be on Sunday from 1:30-3:20. (I brought back some fabulous salted caramels from a Frans, a chocolate shop in Seattle. The final thing I have to do is boot toppers and a hat. The yarn is BULKY and I am using 10.5 needles which I have never used before. The good news is that it takes almost no time to work something up. I apologize for not making any entries until today. I plead exhaustion! The conference is now over and it was worth all the effort we put into its planning and execution. 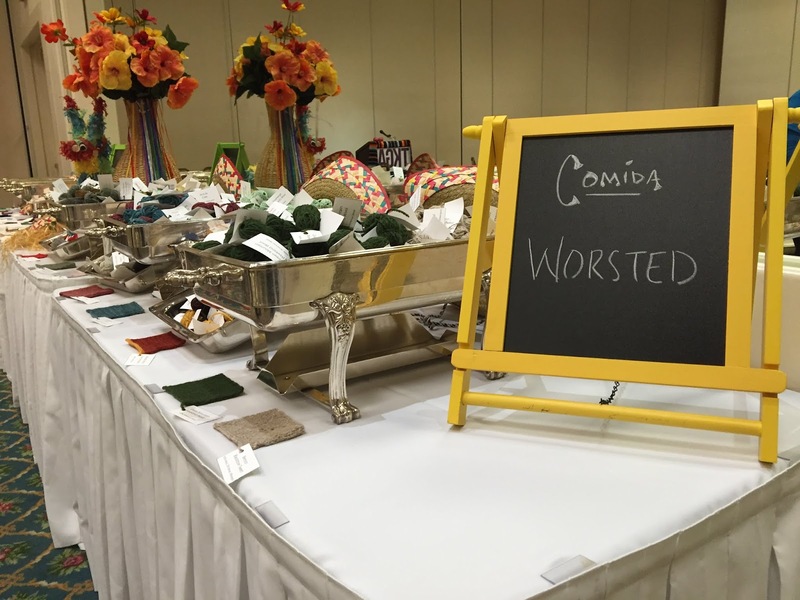 The Yarn Tasting as a huge success. Here is a photo of the "buffet" line for some of the worsted yarn. Here is the menu. We had 40 different yarns for the participants to try. I came home to lessons to review, garments to knit for the Winter issue of Cast On and the post-conference discussions. We start planning for next year immediately. It looks like summer is almost over, based upon the number of lessons I am receiving. Keep up the good work! A week before the conference, Binka Schwan, one of the co-chairs of the Masters Committee called to say that she did not think she would be able to come to the conference. Her husband was diagnosed last February with ALS and David's health would not permit her to attend. Sue Lambert pitched in on Binka's portion of Masters Day and I offered to teach her Knitting 911 class. I didn't tell Binka at the time but I rarely fix my mistakes. I just rip everything out. In preparing for this class, I learned a ton and I am going to devote my next few entries on fixing mistakes. Back to the tip. As I taught the class one of the things I noticed was that several of the students had difficulty recognizing their mistakes. You can't fix something if you can't see it. This tip will focus on seeing and fixing twisted stitches, split stitches and slipped stitches. This photo shows all three. 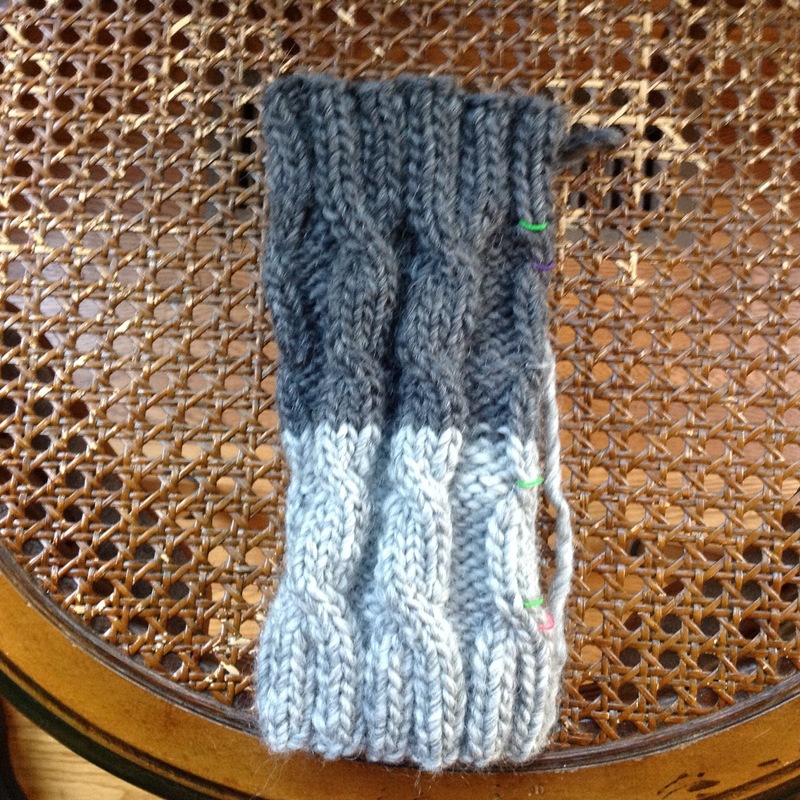 (I knit this swatch on gigantic needles.) When I say twisted stitches, I mean one or two twisted stitches. If you twist all your stitches, this isn't the fix. I've done entries on this topic. Check the index. These are all pretty noticeable on the RS except for the slipped stitch. Here is what it looks like on the WS. Why should you fix these? The only one that can cause major problems is the split stitch. This is a weak spot in the fabric and it might break. Twisted stitches have a different gauge than regular stitches but other than just looking different than the other stitches, they aren't the end of the world. As for a slipped stitch, it is barely noticeable on the RS. I try and look at the fabric I am creating every 10 rows or so (NOT THE STITCHES ON THE NEEDLE!) to see if I can spot any mistakes. It is much easier to fix these things as you see them. If the mistake is quite a few rows down, it may be better to let it go. You can really mess up the tension of the piece. It is a judgement call. 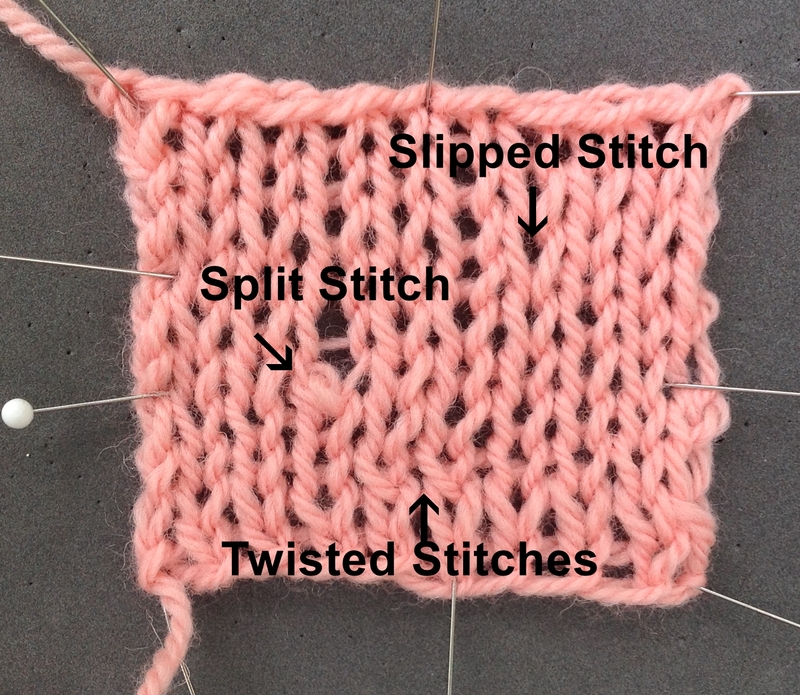 Here is a video of how to fix these things: Fixing Split, Twisted and Slipped Stitches. 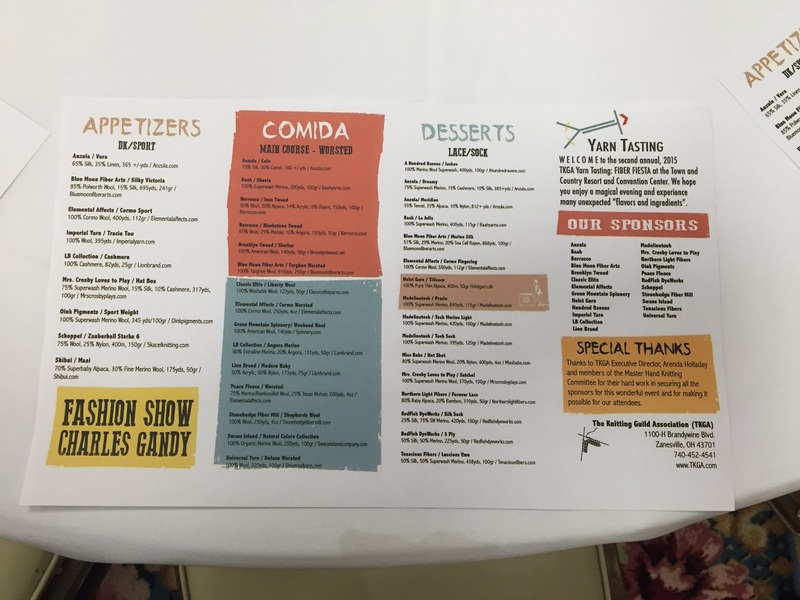 Salon will be on Sunday, August 9th at 1:30 to 3:20. The conference put a major kink in my knitting time. As always (you think I would learn) I am doing way too much for Cast On. 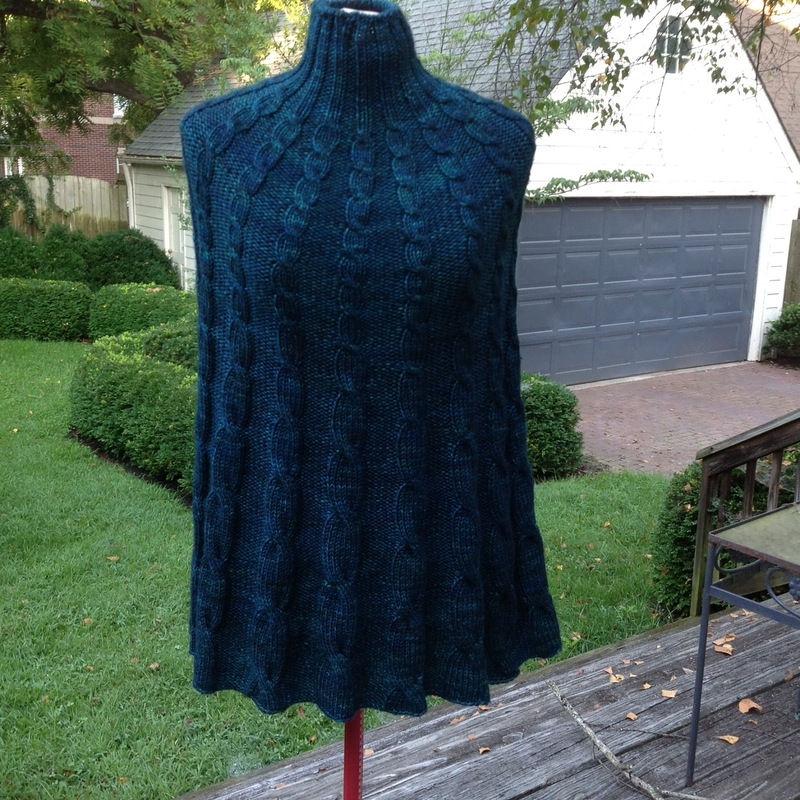 I've finished the Man's sweater for the Fashion Framework article (collars). There is a photo below. I have it on my dress form. It is sized for men but it doesn't look bad on the form. I just realized I should have photographed the back so you can see how wide the collar is. I finished up a sweater last night. I'm calling it Asymmetry. The Stitch Anatomy lesson is on ruffles. These aren't true ruffles. The sleeves are designed to be very long. The ruffles will cover part of the hand. The yarn is Anzula Cole, a silk and camel blend. It was WONDERFUL to work with. I used Size 9 needles. 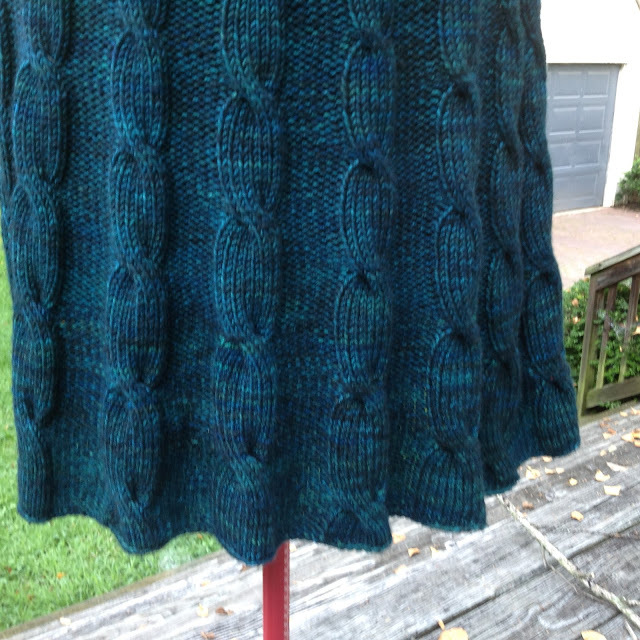 Despite this being a chunky weight, the drape is lovely. And here is a closeup of the neckline. I've got started on the poncho. At TNNA in Columbus there were lots of ponchos in the fashion show. The color is completely wrong. The yarn it TOSH Chunky and the color is Cousteau. It is much greener. The color palette for this issue is jewel tones. I hope to have this finished by the next time I post!